The Everest Base Camp classic is a bucket list worthy trek as it climbs through the Khumbu Valley and follows the footsteps of the Everest summiteers. The Everest Base Camp trek is challenging yet rewarding. Our carefully crafted itinerary reflects our proven track record permitting plenty of time for a safe acclimatization, which is the key to any successful trek in the Everest region. This hike offers unbeatable views, scenery and a unique cultural experience as you pass thru villages and Buddhist monasteries. Our skilled porters and guilds will exceed your expectations on this once in a lifetime adventure as you soar to new heights. The trip begins and ends in colorful Kathmandu, Nepal where you will take an exciting flight to/from Lukla then ascend to the vast glaciers of the Everest Himalayas. 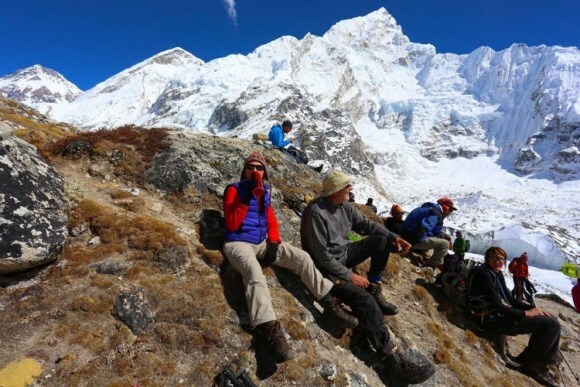 At Base Camp you will be greeted by the legendary Khumbu Ice Fall and summit Kala Patar, which stands over 18,000 ft (5,554 m) and from the summit you will enjoy an unobstructed views of Everest. Accommodations along the way are in teahouses and meals are “a la carte,” allowing you the flexibility to eat what you want and try something new each night if you wish. Our hand-picked guides are trained and licensed by the Nepal Mountaineering Association to ensure you have a safe and enjoyable trek. In addition, Nepal is home to some of the friendliest people, the most beautiful scenery on the planet and a variety of cultural traditions. Ready. Set. Escape! The world famous Everest Base Camp Trek awaits you. Our friendly Ultimate Everest representative will meet you at the airport and drive you to your hotel in Kathmandu. During this meet and greet your guide will discuss the daily activities of your trip. Enjoy an exciting flight from Kathmandu to Lukla – this flight is roughly 45 minutes and offers great views of the Everest region if you can secure a seat on the left of the plane. After landing on a steep mountainside runway you will meet the expedition crew and once the gear is sorted into loads the trek begins. The trail gradually descends on a well-marked trail to Phak Ding, approximately 4 hours of hiking. Today will be spent in Namche Bazaar to acclimatize and prepare our bodies to push higher into the Everest region. The village offers shopping opportunities as well as several lodges. It is a great place to spend a day before heading towards Tengboche. As we trek towards Tengboche views of the legendary mountains begin to unfold, Everest, Lhotse, Nuptse, Ama Dablam as well as others await your praise. Along the way we will pass thru several villages and tea shops. The trail will descend steeply to a bridge at Phunki Tenga where we will stop for lunch and then make the steep climb to Tengboche, infamous for its monastery one of the largest and oldest in the Khumbu region. The trail descends through forest crossing the Imja Khola River and climbs steadily to a village where you will be faced with the imposing Ama Dablam that rises 22,493 ft (6,856 m) into the sky. In Pheriche we will spend the day acclimatizing. Here you can hike up the valley to view Tshola Tsho Lake and the vertical walls of Cholatse and Tawache. Be sure to join your guild for a trek that overlooks Dingboche and prepare yourself for a spectacular view of the Imja Valley and the incredible south face of Lhotse. The trail continues down the wide valley with a steep climb towards the foot of the Khumbu Glacier. In Duglha we will stop for lunch before zigzagging through the boulder-strewn slope of the glacier's terminal moraine. Several rock cairns can be seen at the top of this climb, built as memorials to the many Sherpas who have lost their lives while climbing Mount Everest. Views of Khumbutse, Lingtren, Pumori, Mahalangur Himal, and several other peaks can be enjoyed throughout the day’s trek, until finally reaching Lobuche. Leaving Lobuche we hike parallel to the Khumbu Glacier. The trail navigates its way through ice pinnacles and crevasses. Once in Gorak Shep we will stop for lunch and enjoy beautiful views of snow-capped mountains that loom high above and press on to Everest Base Camp. Today’s journey begins early and will be a demanding hike to the top of Kala Pattar 18,221 ft (5,554 m). The views from Kala Pattar are breathtaking, here you can gaze upon Everest and look deep into the Khumbu ice field. After photos are taken we will descend to Dingboche where we will spend the night. From Dingboche we retrace our footsteps along the river to Tengboche before making your way back to Namche Bizarre. The last day of trekking follows the Dudh Koshi River from Namche Bizarre back to Lukla. Although this is the same trail we hiked in on, your perspective will be greatly different. This is an ideal time to reflect on your one in a lifetime trekking experience and celebrating your achievement. Our Ultimate Everest representative will drive you to the airport in Kathmandu for your return flight home or perhaps to your next adventurous destination.